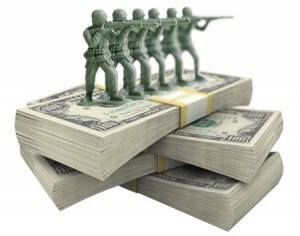 How Generous Are Military Benefits? Simply put, I’m getting more than I gave. Tricare for military retirees and their families is so underpriced that it’s more of a gift than a benefit. Doubt it? Then ask yourself: What is the net present value of an $80,000 annual pension payout with additional full health benefits? Working backward the total NPV would depend on expected returns of a basket of safe investments–blue-chip stocks, dividends and U.S. Treasury bonds. Investment pros such as my friend Barry Glassman of Glassman Wealth Services say 4% is a good, safe return today. But that’s a pitiful yield, isn’t it? It’s sure to disappoint the millions of baby boomers who will soon enter retirement with nothing more than their desiccated 401(k)s–down 30% on average from 30 months ago–and a bit of Social Security. Based on this small but unfortunately realistic 4% return, an $80,000 annual pension payout implies a rather large pot of money behind it–$2 million, to be precise. That’s a lot. One might guess that a $2 million stash would be in the 95th percentile for the 77 million baby boomers who will soon face retirement. That $2 million also happens to be the implied booty of your average California policeman who retires at age 55. By comparison, we find that military benefits are far less generous than those enjoyed by “civilian” government employees. In the grander scheme of things, it’s the overly generous pensions of civilian government employees that present a greater threat to the fiscal stability of the communities they serve. Such benefit plans have forced a number of local governments across the United States into bankruptcy proceedings. To deal with that bigger picture, we propose that state and local governments bring their benefits to be in line with what military reservists receive after similar periods of public service. Although Lieutenant Colonel Slear describes reservists’ benefits as excessively generous, a reduction of the benefits of state and local government employees to the level enjoyed by reservists would least lower the risk that the federal government would bail out state and local governments, and thus would save money at the federal level as well.